You purchase your tile at the local store for a weekend project or for Billy Bob the contractor to install it. The area has been prepped and boxes begin to open and BAM... tile begins to go up the wall. Around six tiles in you notice what appears to be a crack in the next tile. You say to yourself, "OK, you're bound to have one or two cracked tiles in a box, it happens, let's keep it movin'." Then a chipped one comes up, followed by another one with a huge gray mark running through it which looks like it's almost a crack, then another and another. Before long, you've set aside nearly a box full of imperfect marble tile....AHA, and there was the key word- did you catch it? Marble tile isn't man made, it's manufactured by nature; it's beauty is in it's imperfection. If you've gone to your local big box store, my arch nemesis's of design, you've seen a beautiful display of perfectly laid marble tile with not a crack in it. Of course, why would there be cracks in tile? DUH? I have a simple answer for you, they aren't truly cracks at all. They're called fissures. Let me start from the beginning. Marble is natural stone. Even though it is harvested from the ground in huge chunks, then sliced and diced on some precise, high powered machinery, it's natural state is left as is and merely cut into whatever shape is required for the trend of the season. Unlike travertine, which is a bit stronger and quite hard, marble is a soft and far more porous stone. The striking veins that run through it is the characteristic that makes marble desirable, but those veins can run through a very deep section of the tile you got, after all, that same vein may have run through 3' of depth in the chunk before they let Edward Scissorhands get to it. 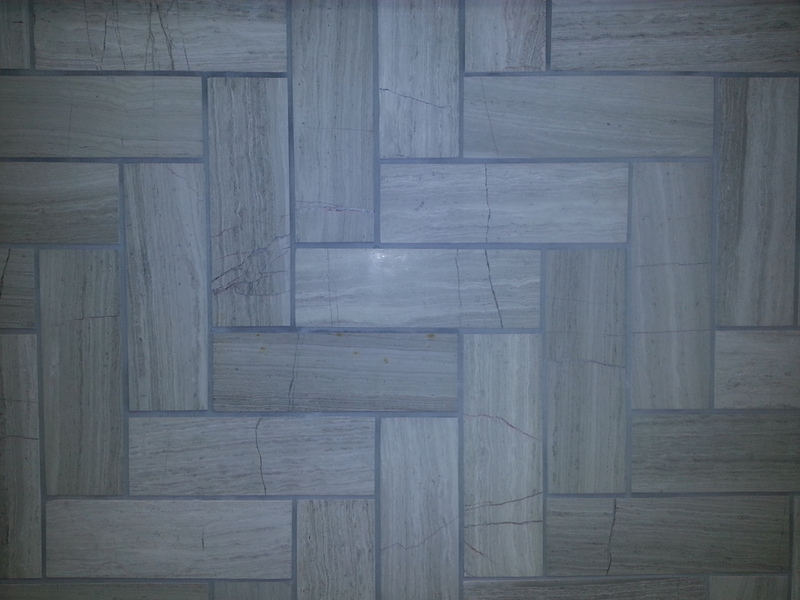 Now it's beautiful compact 6'' x 6" tiles have these same veins running through them and they can go from appearing just on the surface of the tile to penetrating into the tile, appearing to be a crack. Travertine has a similar imperfection that typically goes unnoticed. If you've ever seen a piece of honed travertine, it's a tile in it's simplest form. Travertine has natural air pockets that appear as little carved out circles and dug out shapes in the tile, which are then filled, giving you the cream colored blotches you see in most travertine tile. Marble has fissures which can sometimes become cracks, due to the softness of the stone. Other times, however, it merely stays as a beautiful marbled vein. The "cracks" are not always cracks and a good designer will expect them and educate you on them, to be certain that you are happy with the randomness that nature provides in marble. At times, your designer or tile person may have you sign a "Natural Stone Waiver" as notice that you were warned of the imperfections of marble. Read it carefully and understand that this is normal! I was happy to see a recent display in my local Floor & Decor Store in Tempe, AZ, which happened to show several marble tile walls with their flaws and all. Although I adore the stress cracks, fractures and heavy veining that is marble's natural beauty, you may not feel the same way. If you like the idea of marble, just not the imperfect nature of it's tendencies, perhaps you may want to consider using a porcelain look alike for your next tile project. Porcelain has surpassed natural stone as the most popular way to get the look of stone without the hassles of it's natural state, such as high maintenance, easy staining and imperfections, to name a few. You can find hundreds of porcelains with high quality photo replications of travertine, marble, limestone, quartz and slate, among many other natural stones. Here's a look at the displays I found in my local store. Hopefully, with more designers calling for truth in representation in the design industry, more stores will educate the consumer as to "realism" of their products and tactics to create the perfect space in your home. Until then, AZ's Premier Interior Designer will continue to help as much as I can!